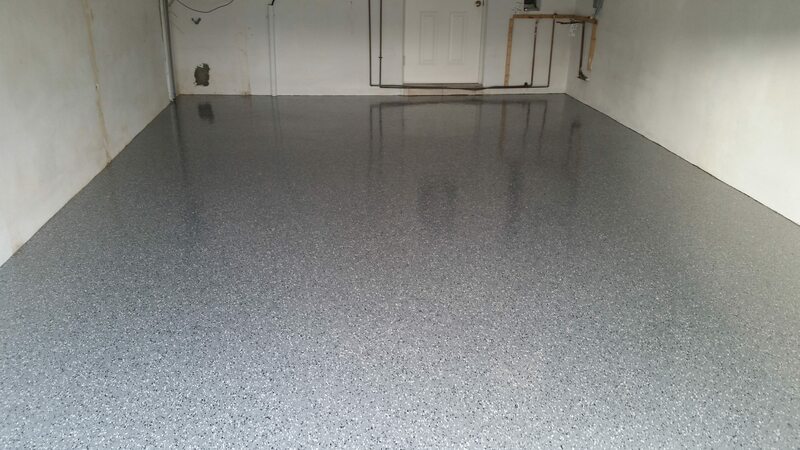 This epoxy garage flooring was installed in Tampa. The epoxy flooring looks and wears like granite and will last for decades. This is a deluxe freature for any home. Here is a new blue metallic epoxy floor recently completed in Flagler Beach. This luxurious flooring looks gorgeous and adds a decorative element rarely seen on a garage floor. These fantastic concrete flooring finishes offer industrial strength wear and durability. This is a marble metallic floor we recently installed in St Petersburg Florida. This green metallic epoxy floor has a gorgeous character and will wear like iron. This garage is going to act as a rec room with pinball machines and as storage space for his two vintage cars. Please call our team of professionals for any questions about our epoxy flooring work. This is a Graphite metallic floor recently completed in Tampa, FL. The customer purchased this home and wanted something special for his three stall garage floor. He settled on the high gloss marble metallic epoxy flooring. The Graphite metallic is a deep color that helps highlight his motor cycle. This floor had a failing epoxy coating that needed to be removed. We used our Edco diamond grinder to create a smooth floor and profile the floor for the epoxy. The finish is high performance Steel Grey epoxy with Pewter Decorative Flakes. The previous floor was carpeted, so the floor preparation included diamond grinding the carpet adhesive off. The diamond grinding provided a good profile for proper adhesion of the concrete flooring. This floor is being used as a showroom for a graphics company that sells print equipment. They wanted a seamless epoxy floor that would hold up to print inks and other chemicals involved with the print process. A high performance epoxy followed by an acrylic urethane topcoat was installed to achieve the chemical resistance they were looking for. This was an existing garage that was built in the 1970s. There were a lot of stains and a layer of carpet adhesive that we had to remove by diamond grinding. Once the floor was completely cleaned up with the diamond grinder, we applied a moisture vapor barrier, 100% solids epoxy and a non yellowing, chemical resistant clear coat.